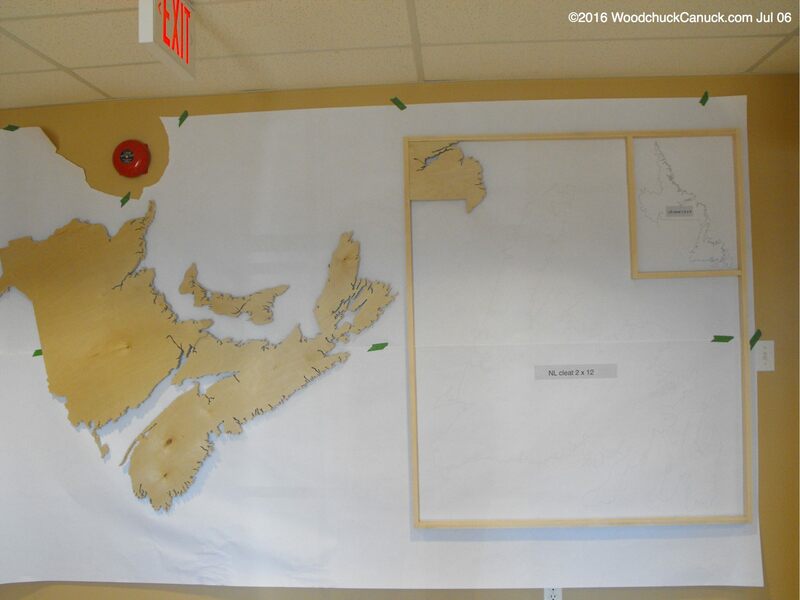 This past week I’ve been working on a commission piece for a wooden map… a large wooden map of the four Atlantic provinces. I’ve been posting some short videos on Instagram as well. I’ll update this page as the project progresses through its stages. 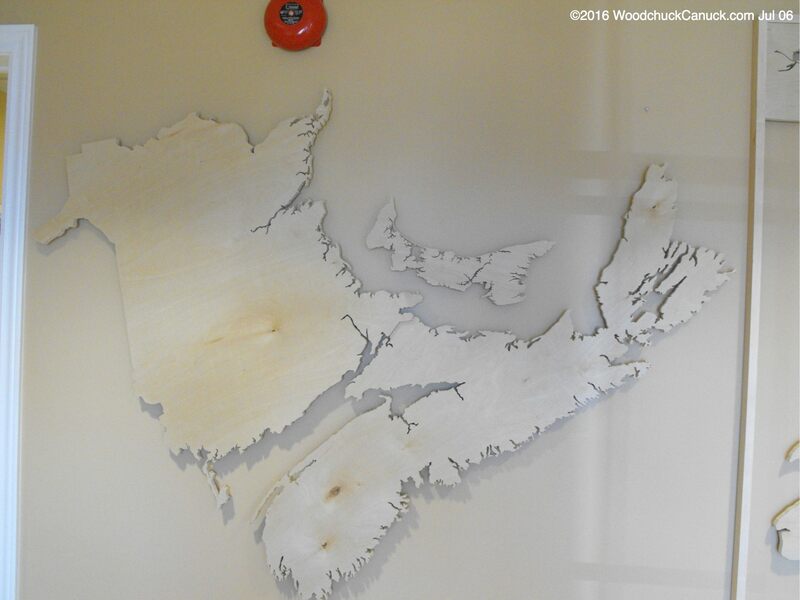 A NS wood map over 4 ft long. Scrolling around the coast of PEI. 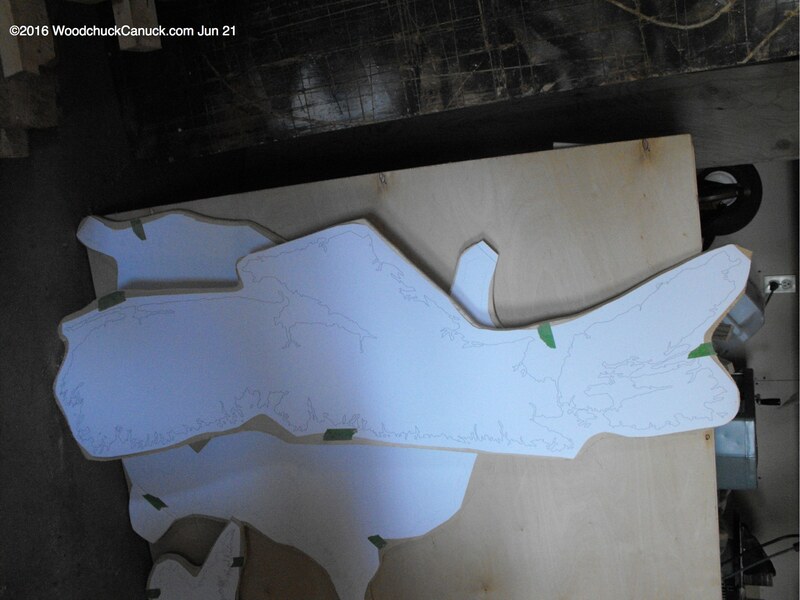 PEI successfully cut out. On to the next province! 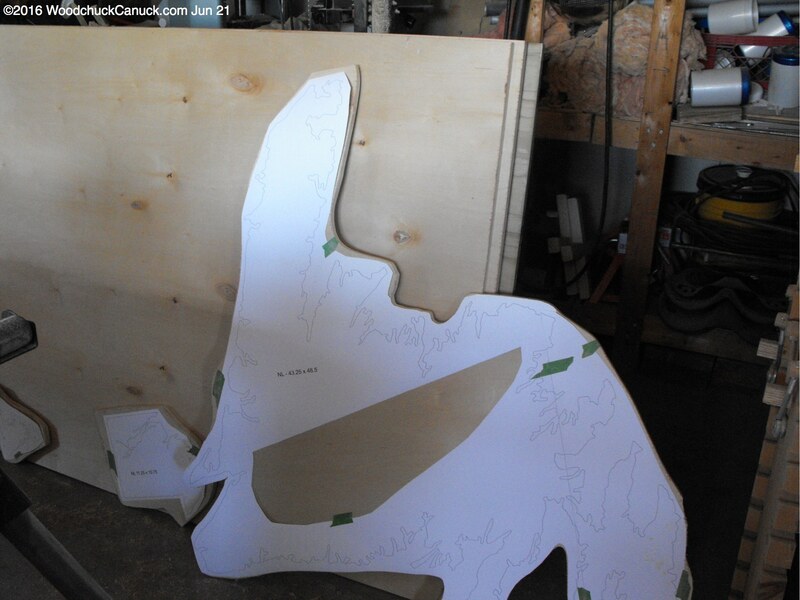 A slice of Labrador, time to make some sawdust. Labrador done. On to the next one. Ahh, The Rock. And I’m not referring to Dwayne ‘The Rock’ Johnson either. 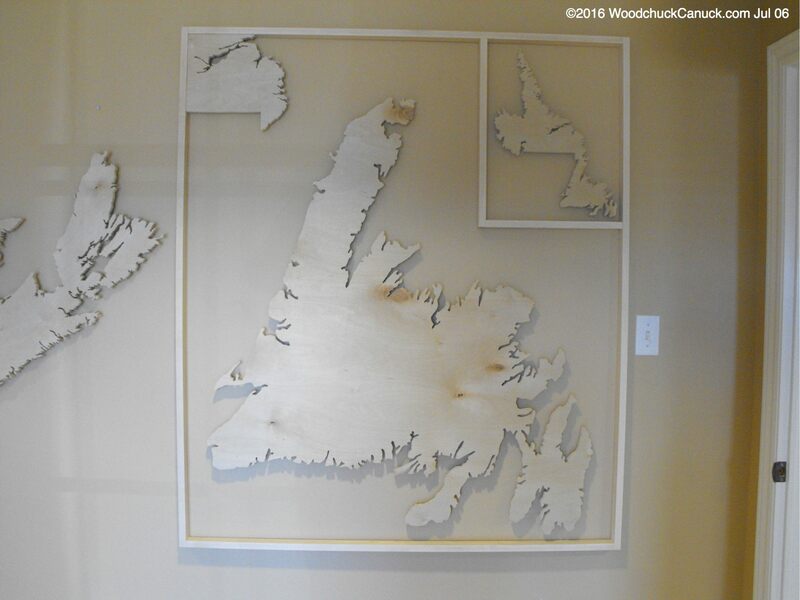  The island of Newfoundland be up next! 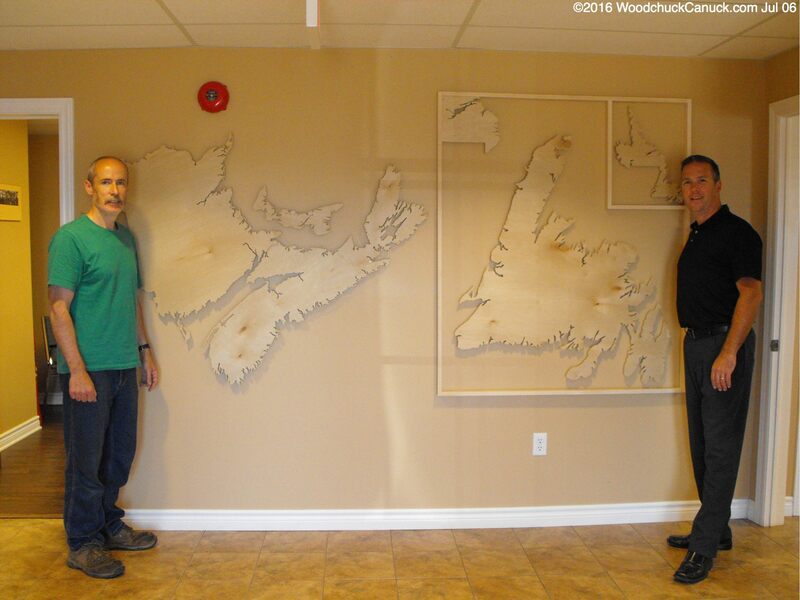 Today we completed the project and installed it at the Mulgrave Office of the CBDC. 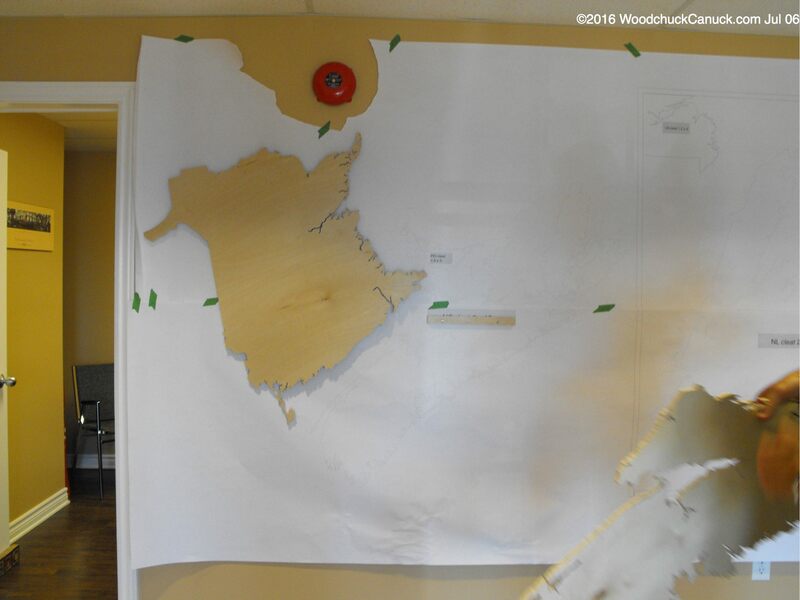 To make this installation as smooth as possible, we drafted a full size template for the positioning of the wood maps and the french cleats that would hold them in place. 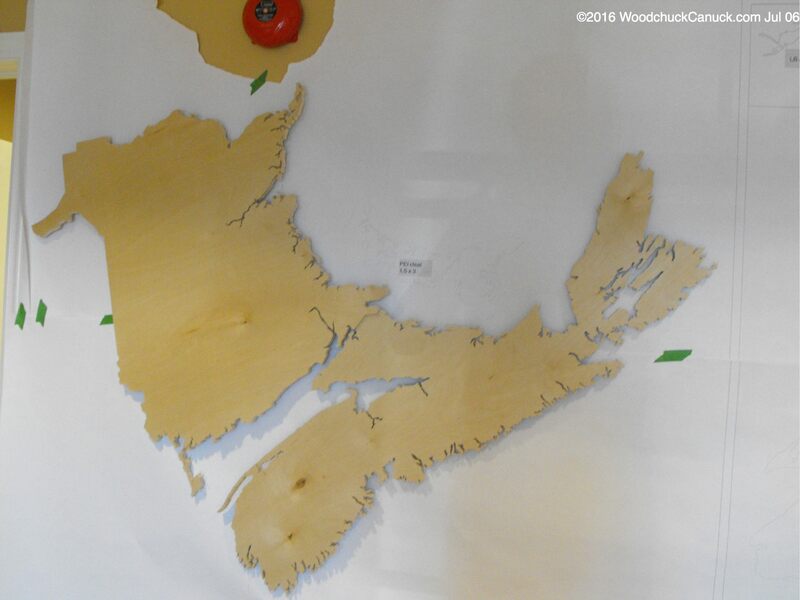 Template setup and New Brunswick in place. Of the entire project, I was most concerned about the meeting of these two provinces. I couldn’t make it all from one piece of plywood so the spilt was at the border. It turned out ok. Saving the best for last, now its time for Newfoundland! 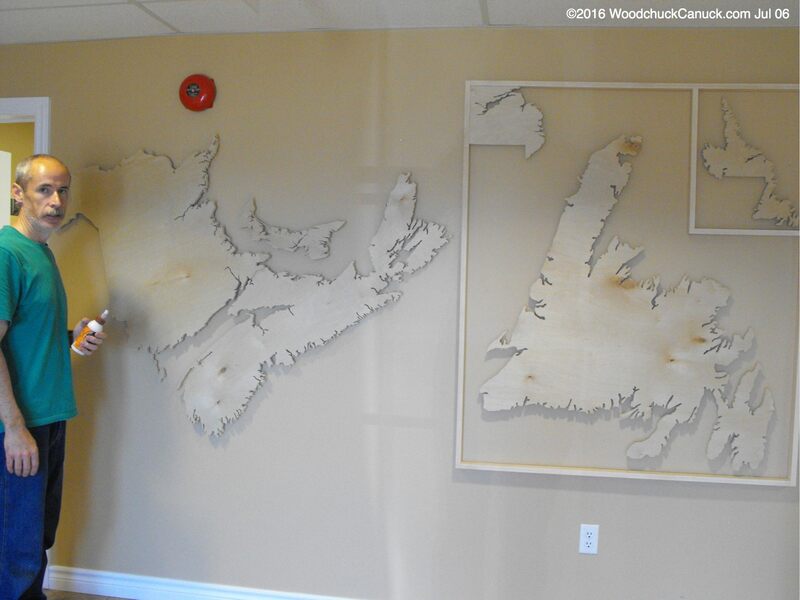 The Maritimes are in place. Installing the french cleats took some fore thought. Where to put them, how to mount them and in what order to mount them. I started with mounting the bottom portion of the cleat onto the wall. Not concerned with finding wall studs, I used expandable metal drywall anchors. The type that expand in behind the drywall. Very solid method for heavier items to be hung on a wall. The bottom portion is mounted to the wall. 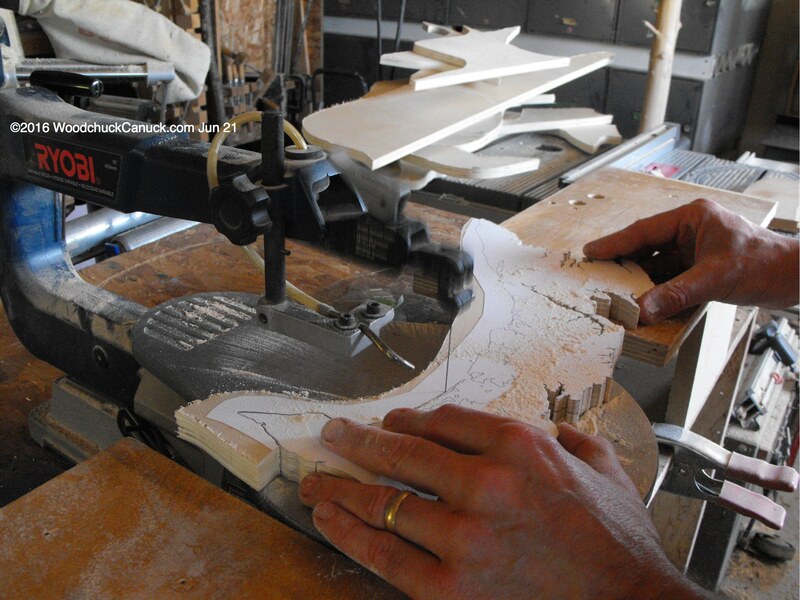 I then placed the top portion in position on the bottom portion of the cleat. The top portion had two holes drilled to fit on 1/4 inch dowel centre finders. With the center finders in place, all we had to do was position the wood map, then press the map against the center finders to pin point the location. 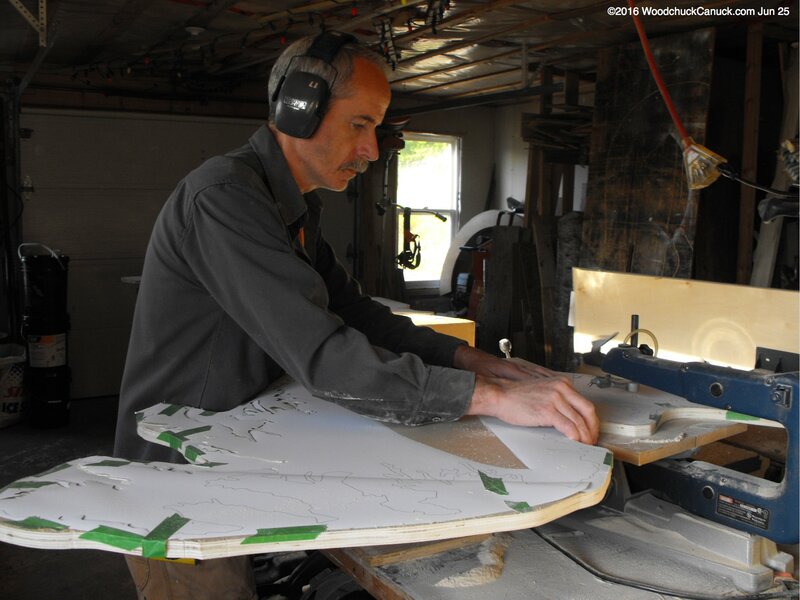 The picture below shows me attaching the top portion to the rear of the wood map for each piece of the project. A bead of Gorilla glue to keep them in place. 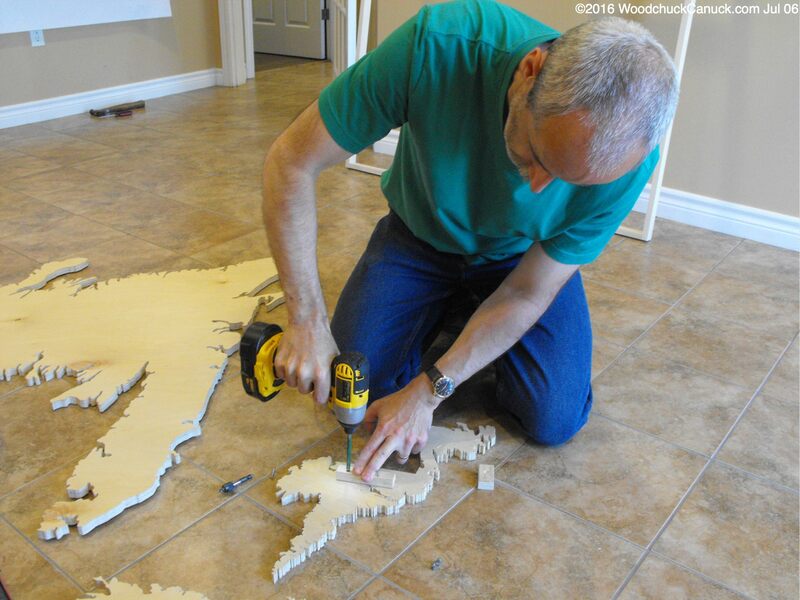 You might not believe it, but all parts of this wooden map came form one sheet of plywood. I purchased a couple sheets of 3/4 birch veneer plywood at Central Home Improvement but in the end I only needed one sheet.